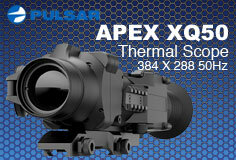 Southern Hog Control, LLC and Thermal Rifle Scope are registered with the Authorize.Net Verified Merchant Seal program. You can shop at Southernhogcontrol.net webstore with confidence. We have partnered with Authorize.Net, a leading payment gateway since 1996, to accept credit cards and electronic check payments safely and securely for our customers. This slection will take you through our order process where you will enter your credit card information for your purchase and then be processed through our Authorize.Net Secure Gateway to complete your transaction. The PayPal selection will allow you to use an exisiting PayPal account to complete your purchase. If you don't have a PayPal account it is easy to setup and FREE (PayPal).